Traditional health care has always been fragmented, episode-centric and very much symptom driven. While our “Health” is continuous and happens as we live through our life, “Healthcare” typically happens between the walls of a hospital or doctor’s office. We do not think about our health until there is a problem and we visit the doctor to get a specific set of symptoms treated or need to complete our annual physical exams. In addition, healthcare decisions are made with a limited context driven by the data collected in a clinical setting and a limited patient profile in antiquated medical systems. Care stops once we leave the doctor’s office and this leads to a huge engagement gap between us and our care providers between our visits to the doctor’s office or hospital. Furthermore, while our health disposition is generally driven by our genome, it is also very much influenced by where we live, where we work, where we travel to and how we live. There is a need for modern healthcare to be more continuous, ubiquitous and driven by a better “context” that considers multiple aspects of our life. Modern technologies such as Wearables, Smart Homes, Connected Cars and Smart Cities are opening new channels for integrating a person’s health into specific dimensions of the person’s life and provide this very context that is needed. As smart sensors permeate our life – at home, at workplace, in the car, around the city we live in – we have unique opportunity to drive holistic wellness of a person in the context of how the person lives, works and travels. This session will focus on the Convergence of Smart Sensors, Mobile and Cloud technologies to make “health” and “healthcare” more continuous leading to a more holistic, sustainable and context-driven health care system that will shift our focus towards a more proactive, flexible and personalized care, beyond the walls of traditional health care organizations. 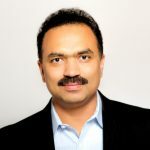 Founder & CEO of Kollabio, Inc.
Ashok Nare is the Founder & CEO of Kollabio, Inc., a Connected Digital Solutions company with a focus on making Healthcare holistic and continuous using Wearables and IoT. Mr. Nare has over 20 years of hands-on, leadership and executive experience in enterprise software development, technical leadership and corporate operations. He served as a CTO at multiple startups prior to starting Kollabio, where he was responsible for new product development, building high performance technical teams and establishing technology strategy and vision. His areas of expertise are Digital Strategy, Digital Transformation, Internet of Things (IoT), New Product Development and Agile Software Development. He is an avid promotor of Digital Health technologies and is a frequent speaker at Health & Technology conferences including the mHealth Summit 2015.